No More Liberal Arts or Social Studies? The added emphasis is my own. The end of the United States’ premier federal program for Russian studies saved taxpayers only $3.3 million—the cost of two Tomahawk cruise missiles or about half a day’s sea time for an aircraft carrier strike group. The development was part of a broader trend: the scaling back of a long-term national commitment to education and research focused on international affairs. Two years ago, the American Academy of Arts and Sciences warned of a hidden crisis in the humanities and social sciences. “Now more than ever,” the academy’s report concluded, “the spirit of international cooperation, the promotion of trade and foreign investment, the requirements of international diplomacy, and even the enhancement of national security depend in some measure on an American citizenry trained in humanistic and social scientific disciplines, including languages, transnational studies, moral and political philosophy, global ethics, and international relations.” In response to lobbying by universities and scholarly associations, Title VIII was resuscitated earlier this year, but it came back at less than half its previous funding level and with future appropriations left uncertain. Given the mounting challenges that Washington faces in Russia and eastern Europe, now seems to be an especially odd time to reduce federal support for educating the next cohort of experts. The rise of the United States as a global power was the product of more than merely economic and military advantages. Where the country was truly hegemonic was in its unmatched knowledge of the hidden interior of other nations: their languages and cultures, their histories and political systems, their local economies and human geographies. Through programs such as Title VIII, the U.S. government created a remarkable community of minutemen of the mind: scholars, graduate students, and undergraduates who possessed the linguistic skills, historical sensitivity, and sheer intellectual curiosity to peer deeply into foreign societies. Policymakers sometimes learned to listen to them, and not infrequently, these scholars even became policymakers themselves. That knowledge flourished in an environment defined by some of the great innovations of American higher education: unfettered inquiry, the assessment of scholarship via rigorous peer review, the expectation that the value of discovery lies somewhere other than in its immediate usefulness, and the link between original research and innovative teaching. If you want evidence-based expertise on terrorism in Pakistan, environmental degradation in China, or local politics in provincial Russia, there is someone in an American university who can provide it. It is harder to imagine a Pakistani scholar who knows Nebraska, a Chinese researcher who can speak with authority about the revival of Detroit, or a Russian professor who wields original survey data on the next U.S. presidential race. But things are changing. Shifting priorities at the national level, a misreading of the effects of globalization, and academics’ own drift away from knowing real things about real places have combined to weaken this vital component of the United States’ intellectual capital. Educational institutions and the disciplines they preserve are retreating from the task of cultivating men and women who are comfortable moving around the globe, both literally and figuratively. Government agencies, in turn, are reducing their overall support and narrowing it to fields deemed relevant to U.S. national security—and even to specific research topics within them. Worse, academic research is now subject to the same “culture war” attacks that federal lawmakers used to reserve for profane rap lyrics and blasphemous artwork. Unless Washington stops this downward spiral, these changes will not only weaken national readiness. They will also erode the habit of mind that good international affairs education was always supposed to produce: an appreciation for people, practices, and ideas that are not one’s own. 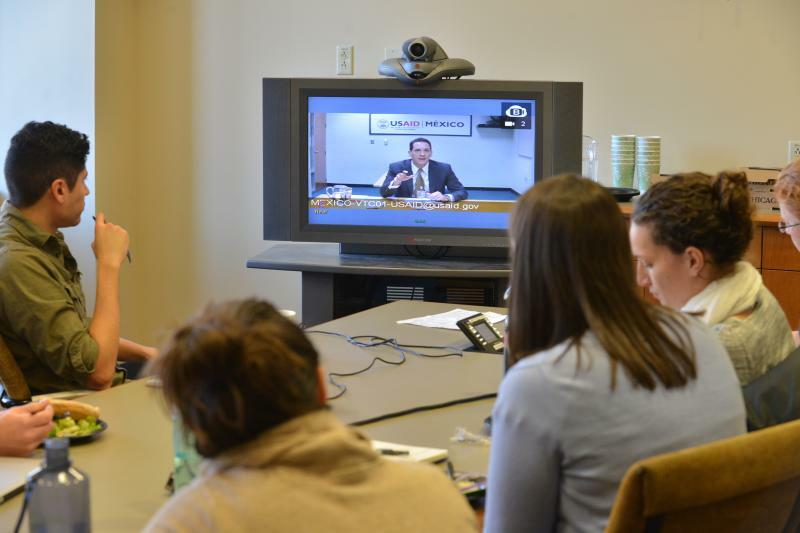 GERALD R. FORD SCHOOL OF PUBLIC POLICY / FLICKRUniversity of Michigan students videoconference with the USAID director for Mexico, August 2014. Americans naturally swing between isolation and engagement with the world, but it is government that has usually nudged them in one direction or the other. A century ago, rates of foreign-language study in Europe and the United States were about the same, with roughly a third of secondary school students in both places learning a modern foreign language. After the United States entered World War I, however, almost half the U.S. states criminalized the teaching of German or other foreign languages in schools. It took a Supreme Court decision in 1923 to overturn that practice. During World War II, the U.S. government made attempts to train up linguists and instant area experts, but these initiatives quickly faded. It was not until the onset of the Cold War that private universities such as Columbia and Harvard devoted serious attention to the problem and opened pioneering programs for Russian studies. The Carnegie, Ford, and Rockefeller Foundations launched grants for scholars working specifically on Soviet politics, history, or economics. Only in the late 1950s did the focus on what is now known as internationalization become a national priority—a response to the Sputnik scare and the sense that the Soviets could soon gain superiority in fields well beyond science and technology. The National Defense Education Act of 1958, followed by the Higher Education Act of 1965 and its successors, provided special funding for regional studies and advanced language training for American graduate students. Among other measures, the legislation created a network of National Resource Centers located at major U.S. universities, which in turn ran master’s programs and other forms of instruction to train the next generation of specialists. In 2010, the total size of this allocation, known as Title VI, stood at $110 million, distributed across programs for East Asia, Latin America, the Middle East, Russia and Eurasia, and other areas. Along with the Fulbright-Hays scholarships for international academic exchanges, established in 1961, Title VI became one of the principal sources of funding for future political scientists, historians, linguists, anthropologists, and others working on distinct world regions. On the face of it, that investment seems to have paid off. American universities have emerged as among the world’s most globally minded. No U.S. college president can long survive without developing a strategy for further internationalization. New schools for specialized study have sprung up across the United States—for example, the University of Oklahoma’s College of International Studies, founded in 2011, and Indiana University’s School of Global and International Studies, which opened in 2012. Older centers—including Georgetown University’s Edmund A. Walsh School of Foreign Service, Johns Hopkins University’s School of Advanced International Studies, Princeton University’s Woodrow Wilson School of Public and International Affairs, Tufts University’s Fletcher School of Law and Diplomacy, and George Washington University’s Elliott School of International Affairs—consistently top world rankings. The U.S. example has become the model for a raft of new institutions around the world, such as the Hertie School of Governance in Berlin and the Lee Kuan Yew School of Public Policy in Singapore, founded in 2003 and 2004, respectively, and the Blavatnik School of Government at Oxford University, founded in 2010. Education and research are now less national priorities than objects of political jockeying. True, young Americans can play video games with their peers in Cairo, chat online with friends in St. Petersburg, and download music from a punk band based in Beijing. But consuming the world is not the same as understanding it. After a steady expansion over two decades, enrollment in foreign-language courses at U.S. colleges fell by 6.7 percent between 2009 and 2013. Most language programs experienced double-digit losses. Even Spanish—a language chosen by more U.S. students than all other languages combined—has suffered its first decline since the Modern Language Association began keeping count in 1958. Today, the third most studied language in U.S. higher education, behind Spanish and French, is a homegrown one: American Sign Language. Something similar has happened in the unlikeliest of places: among professional scholars of international relations. According to an annual survey conducted by the College of William and Mary, 30 percent of American researchers in the field say that they have a working knowledge of no language other than English, and more than half say that they rarely or never cite non-English sources in their work. (Forty percent, however, rank Chinese as the most valuable language for their students to know after English.) At least within the United States, the remarkable growth in the study of international relations in recent decades has produced one of the academy’s more parochial disciplines. Part of the problem lies in the professoriate. An iron law of academia holds that, with time, all disciplines bore even themselves. English professors drift away from novels and toward literary theory. Economists envy mathematicians. Political scientists give up grappling with dilemmas of power and governance—the concerns of thinkers from Aristotle to Max Weber and Hans Morgenthau—and make their own pastiche of the natural sciences with careful hypotheses about minute problems. 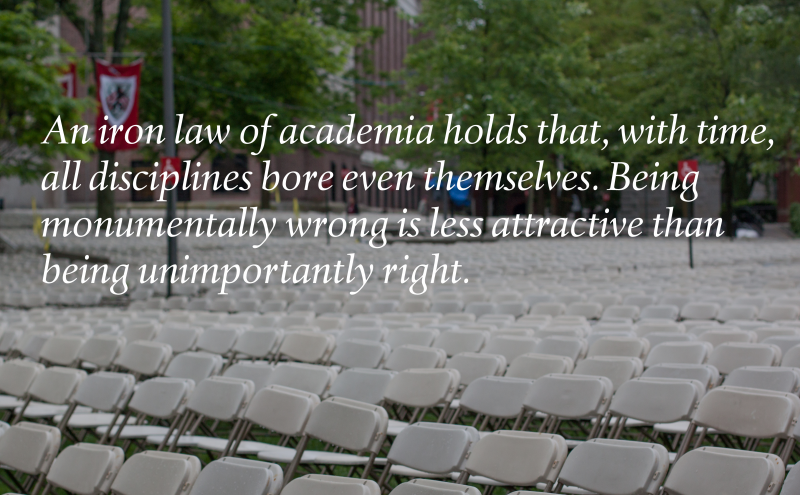 Being monumentally wrong is less attractive than being unimportantly right. Research questions derive almost exclusively from what has gone unsaid in some previous scholarly conversation. As any graduate student learns early on, one must first “fill a hole in the literature” and only later figure out whether it was worth filling. Doctoral programs also do a criminally poor job of teaching young scholars to write and speak in multiple registers—that is, use jargon with their peers if necessary but then explain their findings to a broader audience with equal zeal and effectiveness. TIM SACKTON / FLICKRA sea of chairs ahead of Harvard University’s 2013 commencement. Still, the cultishness of the American academy can be overstated. Today, younger scholars of Russia and Eurasia, for example, have language skills and local knowledge that are the envy of their older colleagues—in part because of decades of substantial federal investment in the field and in part because many current students actually hail from the region and have chosen to make their careers in American universities. Even the increasing quantification of political science can be a boon when abstract concepts are combined with grass-roots understanding of specific contexts. Statistical modeling, field experiments, and “big data” have revolutionized areas as diverse as development economics, public health, and product marketing. There is no reason that similar techniques shouldn’t enrich the study of international affairs, and the private sector is already forging ahead in that area. Companies such as Dataminr—a start-up that analyzes social-media postings for patterns to detect breaking news—now track everything from environmental crises to armed conflict. Foreign policy experts used to debate the causes of war. Now they can see them unspooling in real time. The deeper problems are matters of money and partisan politics. In an Internet-connected world infused with global English, private funders have radically scaled back their support for work that requires what the political scientist Richard Fenno called “soaking and poking”: studying difficult languages, living in unfamiliar communities, and making sense of complex histories and cultures. Very few of the major U.S. foundations finance international and regional studies on levels approaching those of two decades ago. Foundation boards, influenced by the modish language of disruption and social entrepreneurship, want projects with actionable ideas and measurable impact. Over the short term, serious investments in building hard-to-acquire skills are unlikely to yield either. And these developments don’t represent a mere shift from the study of Russia and Eurasia to a focus on the Middle East and East Asia—a pivot that would be reasonable given changes in global politics. The Carnegie Corporation of New York, for example, ended its prestigious senior fellowship program on Muslim societies in 2009 and wound down its wider Islam Initiative shortly thereafter. The U.S. government has followed suit. The suspension of Title VIII was only the latest in a series of cutbacks. The Foreign Language Assistance Program, created in 1988 to provide local schools with matching grants from the Department of Education for teaching foreign languages, ended in 2012. The previous year, Title VI funding for university-based regional studies fell by 40 percent and has flatlined since. If today’s Title VI appropriation were funded at the level it was during the Johnson administration, then it would total almost half a billion dollars after adjusting for inflation. Instead, the 2014 number stood at slightly below $64 million. The same thing has happened with direct funding to undergraduates and graduate students, particularly when it comes to the National Security Education Program (NSEP), which offers students financial assistance for foreign-language study and cultural immersion. NSEP was established in 1991 on the initiative of David Boren, then a Democratic senator from Oklahoma, with the goal of training a new, post–Cold War generation of foreign affairs specialists. The program’s signature elements—Boren Scholarships and Boren Fellowships—offer grants of up to $30,000 to highly qualified undergraduates and graduate students in exchange for at least a year of federal government service in national security after graduation. For all its prestige, however, and despite nominal support among both liberals and conservatives, the Boren program offers fewer such awards today than it did in the mid-1990s. Another element of NSEP is an innovative initiative for heritage speakers—American citizens who possess native abilities in a foreign language and wish to develop professional-level skills in English—and it, too, has shrunk. The initiative has never been able to fund more than 40 people per year, most of them native speakers of Arabic or Mandarin, and the number has been steadily falling, reaching just 18 in 2014. (This program is now housed at Georgetown University, where I teach.) In a somewhat encouraging sign, enrollment has been growing markedly in NSEP’s Language Flagship program, which gives grants to colleges to field advanced courses in languages deemed important for national security. But the raw numbers reveal just how small the United States’ next generation of linguists actually is. Last year, the total number of students enrolled in NSEP-sponsored courses for all the “critical languages”—Arabic, Chinese, Hindi, Korean, Persian, Portuguese, Russian, Swahili, Turkish, Urdu, and Yoruba—was under a thousand. In tandem with these trends, scholarly research in global affairs, especially work funded by the National Science Foundation, has come under growing attack. The annual appropriation for the NSF is around $7.3 billion, of which a fraction—less than $260 million—goes to the behavioral, social, and economic sciences. Of that figure, only about $13 million goes to political scientists, and an even smaller amount goes to those doing research on international affairs. Still, these scholars now receive the kind of lambasting that used to be directed mainly against the National Endowment for the Arts. As just one example, for the past two years, the NSF has been the particular focus of the House Committee on Science, Space, and Technology, which oversees the foundation along with portions of the Federal Aviation Administration, NASA, and other agencies. The committee intends to subject all NSF-funded projects to a relevance test that would require the foundation to certify that every taxpayer dollar is spent “in the national interest.” In a recent opinion piece for The Hill, Lamar Smith, the Republican representative from Texas who chairs the committee, pilloried NSF-funded researchers working on the environmental history of New Zealand, women and Islam in Turkey, and local politics in India. “How about studying the United States of America?” he wrote. “Federal research agencies have an obligation to explain to American taxpayers why their money is being used to provide free foreign vacations to college professors.” In response to this kind of criticism, academic associations have hired their own lobbyists—a recognition of the fact that education and research are now less national priorities than objects of political jockeying, on par with items on the wish lists of private corporations and interest groups. The crusade for relevance is part of a broader development: the growing militarization of government-funded scholarship. Researchers in international and regional studies have always doffed a hat to strategic priorities. Even historians and literature professors became accustomed to touting their work’s policy significance when they applied for federal grants and fellowships. But today, a substantial portion of assistance comes directly from the U.S. Department of Defense. The department’s Minerva Initiative provides support for research on “areas of strategic importance to U.S. national security policy” and for “projects addressing specific topic areas determined by the Secretary of Defense,” as the call for applications says. In the current three-year cycle, which runs until 2017, the program expects to disburse $17 million to university-based researchers in the social sciences. Millions more have been allocated since the first round began in 2009. 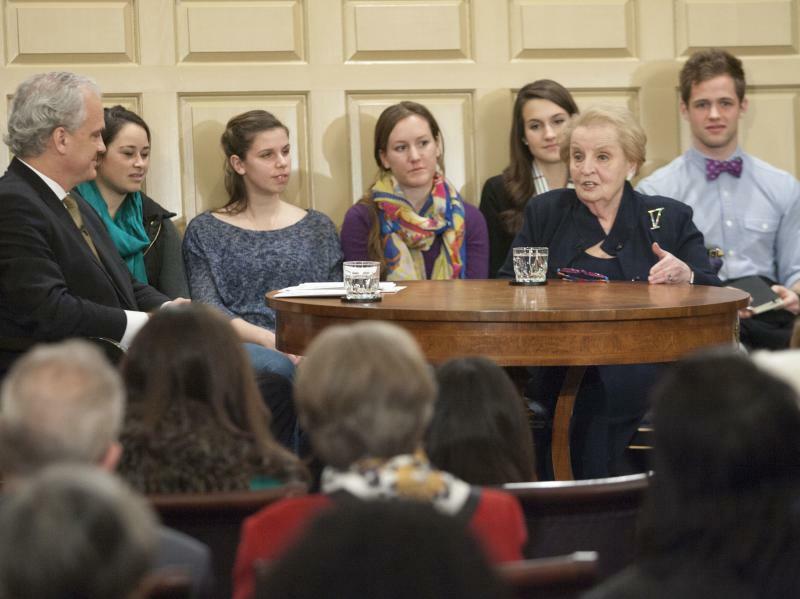 MILLER CENTER / FLICKRFormer U.S. Secretary of State Madeleine Albright delivers a talk at the University of Virginia, February 2013. But there is a substantial difference between research that broadly supports the national interest and work that directly enhances national security. Developing new techniques for teaching Arabic and Chinese, for example, or analyzing EU regulatory policy is the former without necessarily being the latter. When scholars need research money and Washington needs actionable analysis, the danger is that the meaning of the term “national security” can balloon beyond any reasonable definition. Even more worrying, in an era of real transnational threats, knowledge that used to be thought of as the purview of the police—say, how to manage a mass protest and deter crime—can easily slide into matters of surveilling and soldiering. Congressional staff could spend their time on things other than trips to the NSF archives to root out recondite research topics for public ridicule. It was once the case that state-supported research was meant to give the United States an edge in its relations with other countries. Now, with programs such as Minerva, the temptation is to give government an edge over the governed. Recent Minerva projects have focused on the origins of mass political movements, “radicalization” among Somali refugees in Minnesota, and—in the words of one project summary—“the study of Islamic conversion in America,” aimed at providing “options for governments to use for the tasking of surveillance.” Professors funded by Minerva work with project managers at U.S. military research facilities, who in turn report to the secretary of defense, who has by definition found the research topics to be matters of strategic concern. In an incentive structure that rewards an emphasis on countering global threats and securing the homeland, the devil lies in the definitions. In this framework, the Boston Marathon bombing becomes a national security problem, whereas the Sandy Hook massacre remains a matter for the police and psychologists—a distinction that is both absurd as social science and troubling as public policy. Things could be different. Funding for foreign-language study, cultural immersion, and advanced inquiry could be a federal priority, with funding levels restored to what they were in previous years. Research and teaching could be placed at one remove from the national security apparatus, as they are in the Department of Education’s model for Title VI or in a public trust along the lines of the National Endowment for the Humanities. The creation of knowledge and its communication through instruction could be made immune from “gotcha” politics. And congressional staff members could spend their time on things other than trips to the NSF archives to root out recondite research topics for public ridicule. At the same time, universities have their own part to play. Disciplines can, and do, go haywire. Researchers and graduate students should be judged not by how well they embed themselves in a scholarly mainstream but by how truly original and world-connected they aim to be. Fundable scholarship should not be reduced to a narrow matter of national security. But it is hard to see why anyone would make a career of international affairs—a pursuit that begins with valuing people, cultures, and polities in all their diversity—without some commitment to serving the public interest. Given that no one can know where the next crisis will erupt, having a broadly competent reserve of experts is the price of global engagement. Yesterday’s apparent irrelevancies—the demographics of eastern Ukraine, for example, or popular attitudes toward public health in West Africa—can suddenly become matters of consequence. Acquiring competence in these sorts of topics forms the mental disposition that J. William Fulbright called “seeing the world as others see it”—an understanding that people could reasonably view their identities, interests, politics, and leaders in ways that might at first seem bizarre or wrong-headed. It also provides the essential context for distinguishing smart policy-specific questions from misguided ones. Great powers should revel in small data: the granular and culture-specific knowledge that can make the critical difference between really getting a place and getting it profoundly wrong. International affairs education and research are also part of a country’s domestic life. Democratic societies depend on having a cadre of informed professionals outside government—people in universities, think tanks, museums, and research institutes who cultivate expertise protected from the pressures of the state. Many countries can field missile launchers and float destroyers; only a few have built a Brookings Institution or a Chatham House. Yet the latter is what makes them magnets for people from the very places their institutions study. The University of London’s nearly century-old SOAS, for example, which focuses on Asian and African studies, is a beehive of languages and causes, where Koreans, Nigerians, and Palestinians come to receive world-class instruction on, among other things, North and South Korea, Nigeria, and the Palestinian territories. All of this points to just how important international and regional studies can be when they are adequately funded, publicly valued, and shielded from the exigencies of national security. Their chief role is not to enable the makers of foreign policy. It is rather to constrain them: to show why things will always be more complicated than they seem, how to foresee unintended consequences, and when to temper ambition with a realistic understanding of what is historically and culturally imaginable. For more than half a century, the world has been shaped by the simple fact that the United States could look at other countries—their pasts and presents, their myths and worldviews—with sympathetic curiosity. Maintaining the ability to do so is not only a great power’s insurance policy against the future. It is also the essence of an open, inquisitive, and critical society. All visitors get access to one full-length article each month. Register for free to continue reading. Registered users get access to one free article every month. REGISTERHave an account? Log in here.